SIMPLETEC Roller and Idler Rebuilding Machine WS-900 is an extra wide machine, which can accommodate idlers up to 900 mm diameter. The idler/roller can be tilted by 45° clockwise and counterclockwise. As the opening is quite wide, even two parts can be welded at a time. The Roller and Idler Rebuilding Machine is provided with a heavy duty welding head, powered by a 1000 Amps, heavy duty output power source. The welding head has a hopper to supply the flux and wire feeder unit, which can feed 2.8 mm to 4 mm diameter wires. 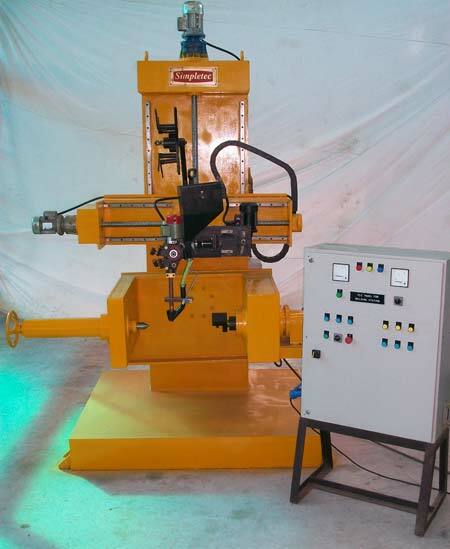 Further, this Roller and Idler Rebuilding Machine is supplied with power source, wire feeder and flux recovery unit. Also, the Roller and Idler Rebuilding Machine is provided with two welding heads and two power sources.